With an enviable location in the sovereign territory of the Royal Gardens, the Terasa U Zlaté studně restaurant has the potential to rule over haute cuisine in Malá Strana. So far, however, it has been a somewhat neglected “national treasure”. The U Zlaté studně hotel and restaurant stands between the twisting streets leading to Prague Castle, in the peaceful oasis of the recently renovated Ledeburská Garden. In its own way it is a magical place. The building has a mysterious history – it’s said that long ago it was owned by the astronomer Tycho de Brahe when he served under Emperor Rudolf II, and the local well was said to be connected to the city’s security system, the corridors connecting the palaces and leading out of the city’s fortifications. 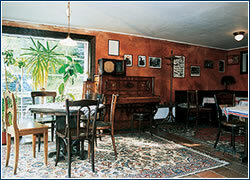 In the 1970s it housed a famous wine pub that was frequented by Prague bohemians. Although the building underwent comprehensive renovations and offers every comfort, you still get the feeling that time has stopped there. Prague restaurateur Roman Řezníček, whose renowned Pálffy Palác celebrates its tenth anniversary this year, was long drawn to U Zlaté studně. “I first visited the restaurant about five years ago, and I was captivated by it,” he says, recalling how he felt as he stood on the terrace with the city spread out below him. But the hotel, along with the entire lower part of the castle, gardens included, was delapidated, and reconstruction work had been in progress for several years. 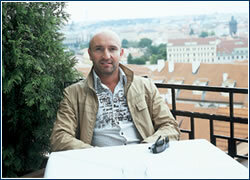 In 2002 an opportunity arose, and Řezníček agreed with the hotel’s owner to take over the operation of the restaurant. “Hotel restaurants are generally secondary, just a service for the guests. Only a very few of them become famous. But this space simply cries out to be used; it cloaks great potential,” Řezníček claims convincingly. Thanks to his venue’s location between the tourist-drawing Castle and the so-called parliament quarter, you have to agree. Řezníček started taking the necessary steps, including bringing in head chef Pavel Sapík, a member of the Czech national team. “The interior and the entire image needed basic changes, and the restaurant had to be made independent,” the manager says. 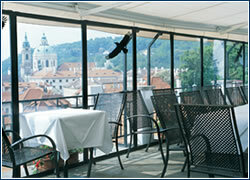 The restaurant opened in its new form last May, and Řezníček does not hide his ambitions to achieve Michelin recognition. To Michelin the most important thing is how a restaurant uses local ingredients, such as rabbits, poultry, and cabbage, and also how it treats seasonal foods, such as asparagus, strawberries, and other produce in this case. So the menu lists duck prepared several ways – marinated breast with a small salad, beans, and sherry walnut dressing as an appetizer, or breast with red cabbage, potato gnocchi, and forest honey sauce as a main course. Lamb sirloin comes marinated in fresh rosemary and garlic with polenta cake, and the grilled veal back is flavored with truffle purée and dried plum sauce. Seafood also makes an appearance – tiger prawns served with saffron risotto, St. Jacques on rice cakes, and fillets of sea bass with cuttle fish tagliatelli. The dessert menu features classics like sorbets, warm raspberries, and cre`me bru^lée. The wine list is modest, but offers selections from well-known areas of France, Australia, Italy, South Africa, and the Czech Republic. It’s not easy to create a high-quality restaurant that draws gourmets from all around the world, and it’s even harder to stay at the top. But the thirty-three-year-old Řezníček, who daily shuttles between his restaurants Pálffy Palác, Sovovy Mlýny, U Zlaté studně, and the night club Mecca, is still sufficiently energetic. His current plan is to bring many Michelin award holders to the restaurant. In mid-April he hosted the head chef from the Pershing Hall hotel in Paris, Hervé Courtot. Řezníček likes travelling around Europe in search of culinary experiences and inspiration, and he always takes along someone from his team, because the human factor plays a greater role in gastronomy than any other. “The key to success is to find the right people, who think as you do,” he says. SANDWICHED between two cobbled streets in the bustling Old Town neighborhood, this stylish yet “downtempo” café provides an oasis of calm for diners seeking lighter fare. 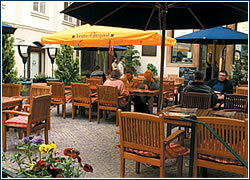 Connected to the Iron Gate hotel, as well as the fashion store which is its namesake, Café Bogner offers a seasonal menu that includes salads, sandwiches on baguette, cre`pes, and desserts. There are even special “fondue nights” that should make the al fresco atmosphere ideal for couples in summer. Having lunch at the restaurant Teta Marta is like dining in someone’s living room. The walls are adorned with “family” photographs, the shelves are filled with books, and the tables, chairs, and upholstered couches look like they date back eighty years. There’s a fireplace, a garden, and even domestic animals. Most importantly, the cuisine will please even the most demanding gourmets. 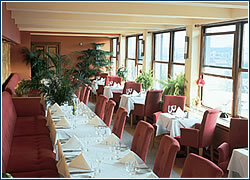 Regular guests return for the chef’s specialities – mainly meats prepared in various ways. Dishes like pork tenderloin medallions in damson-cheese sauce (CZK 87) or rare pepper steak with red pepper sauce (CZK 152), draw locals and tourists alike. Nearby there are interesting trails for cyclists or walks through rocky landscapes – a favorite destination being the nearby Pantheon cliff castle. Above the restaurant there are simple rooms if you want to spend the night. How to get there: Malá Skála is a village in northern Bohemia, about 100 kilometers from Prague in the direction of Trutnov. When you arrive from Prague take your first left towards Frýdštejn.